Ashlie Scullion-Salsi is a 3rd generation Italian-American from the towns of Atelata, Roccacinquemiglia, and Castil de Sangro in Abruzzo, Italy. Her great grandfather was the late Dan Cercone who played a significant part in Bloomfield’s strong ethnic culture alongside his wife, Mary. Their daughter, Ashlie’s grandmother, Janet Cercone Scullion along with her husband, Ashlie’s grandfather, the late Robert Scullion Sr., also put an ample amount of time and effort into keeping Bloomfield’s traditions and culture alive for future generations. Ciao Pittsburgh interviewed Ashlie, who is currently an Account Manager for Bob Scullion & Associates—a distributor for the gas, water and electric utility companies across the United States. Ashlie was recently married to Noah Salsi, a Physician Assistant at Presbyterian Hospital. 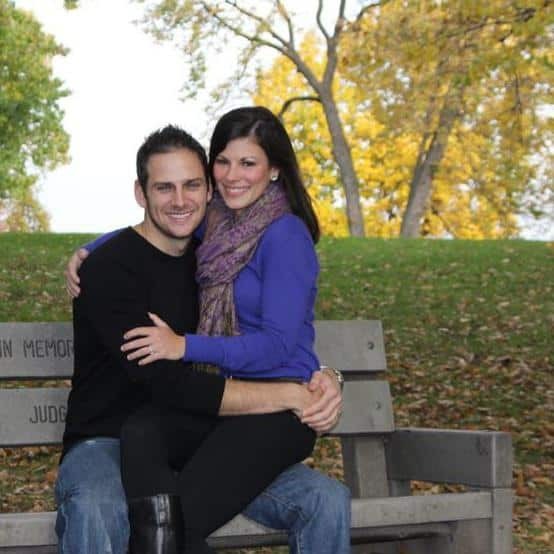 They are both Duquesne University graduates and are currently residing in the colorful neighborhood of Pittsburgh’s Little Italy, also known as Bloomfield where her parents, Jennifer DeSabato-Scullion and Robert Scullion Jr, and grandparents were born and raised. CP: What do you find to be the most rewarding aspect of your career? Ashlie: The most rewarding aspect of my career is to be able to work with my father every day. It’s not every day that you get to work with your family, support your family business’ growth and meet wonderful, loyal people. The utility industry and its employees act as a family much like I grew up. Everyone is willing to help and teach one other in many different facets. It’s an honor to be part of an industry like this. CP: How long have you lived in Pittsburgh and what do you enjoy most about the city? Ashlie: I was born and raised in Bloomfield for 28 years and currently reside in my neighborhood. I enjoy Bloomfield the most because it is a microcosm of what the city of Pittsburgh is. My neighborhood, like the city of Pittsburgh, was built on the backs of immigrants. The warmth and friendliness begins where I live and transcends in a greater way to this wonderful city. CP: Can you tell us about your Italian heritage? Ashlie: It’s embedded very deeply within me by way of customs and traditions. My family heritage consists of Italian—my great grandparents on both the Cercone and DeSabato side. The Cercone’s and the DeSabatos’ both married people from Abruzzo, Italy, which solidifies my heritage by way of being from one region in Italy. My family is not from mixed regions as some Italian families are. Thus, the dialect, the family values, the cooking styles, the music and ways of life are bound tightly by common ground. CP: What are some of your favorite Italian traditions and why? Ashlie: My favorite Italian tradition is the “La Vigilia,” the celebration of the seven fish on Christmas Eve. The Cercone Family dinner has been celebrated for 77 years and has now become the Cercone/Scullion Family Tradition which has been celebrated for the past 60 years. That dinner continues to take place in my late great grandfather’s home, Dan Cercone, on Cedarville Street with a new generation residing there and perpetuating this tradition of love. Every year all of the men and women of multiple generations come together for a day of inter-spiritual awakening, caring, and working together in harmony to create a masterful family dinner that bonds participants in the most unimaginable way. It is an event that fosters love, and growing together. CP: Have you had a chance to visit Italy and the town where your ancestors are from? Ashlie: I had the opportunity to visit northern Italy and it is my full intention to go to Abruzzo in the spring of this year. CP: What does being Italian mean to you? Ashlie: Being Italian means that I have been given the opportunity to know my roots—my relatives who are nearby as well as those who live from a distance. I am blessed to have the opportunity to have these interactions being active in the Italian lodges of the Atelata Women and the Roccacinquemiglia Society. They both play an important role in staying connected to people who are my blood relatives. The lodge not only provides the opportunity for friendships and good times, but they also keep us close during sad times and family illnesses and losses. CP: Do you have any particular favorite Italian restaurants (here in Pittsburgh or anywhere in the country)? Ashlie: My FAVORITE Italian restaurant is Girasole. That is where my husband and I had our first date and where he proposed, but I also love and enjoy Sausalito located in Bloomfield. They both ave great food and create a charming atmosphere. CP: What accomplishments in life are you most proud of? Ashlie: One of my proud accomplishments is graduating from Duquesne University and achieving my goal of working in the Marketing and Sales Industry. CP: What are some of your favorite hobbies? Ashlie: Some of my favorite hobbies are being able to spend meaningful time with family and friends, continuing a lifetime of learning through travel experiences, and investigating other cultures and traditions through dining experiences and attending cultural events outside of my own. CP: Last movie you saw? CP: What is your favorite TV show? CP: What else would you like our readers to know about you? Ashlie: I’m dedicated to nurturing my friendships and relationships with others because that is the most substantive and meaningful way to make a difference in others’ lives..